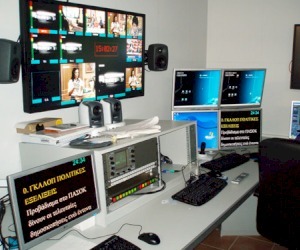 New, entirely automated, digital TV station. All automation is by VSN (continuity with MATIC, news with AIRNEWS, ingest with 3-channel AUTOREC, mpeg4 archive and legal recording). Cameras (DXC-D55) and vision mixer (DVS9000) are by SONY, SPG, Router, Multiviewer by EVERTZ and interfaces by Crystal Vision.